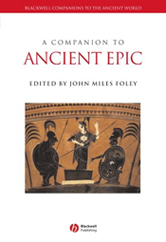 A Companion to Ancient Epic presents for the first time a comprehensive, up-to-date overview of ancient Near Eastern, Greek and Roman epic. It offers a multi-disciplinary discussion of both longstanding ideas and newer perspectives and considers the interrelation between these different traditions. Provides a balanced overview of longstanding ideas and newer perspectives in the study of epic. Shows how scholarship over the last forty years has transformed the ways that we conceive of and understand the genre. Covers recently introduced topics, such as the role of women, the history of reception, and comparison with living analogues from oral tradition.